The green monster always labels us who are validated [alleged to be prison gang members or associates] as violent and threats to other inmates, staff and the security of the institution. The thing is this: They fail to show proof of these claims. Staff assaults had nothing to do with the supposed reason for why those individuals were validated. Yet, CDCR and CCPOA [the guards’ union] continuously cites “staff assaults” or “threats to staff safety” as one of the primary justifications for placing and keeping us in the SHUs and ASUs. It’s obvious why they always bring up “staff assaults” when the “validation” issue is brought up though. They do it to demonize us and to gain sympathy from Sacramento politicians and the public. They’re also real quick to display a handful of weapons to the media to show examples of the “supposed” artillery we use. Well, nobody in the media has ever argued that they want to see records of when, where and how they found these weapons. I say this because CDCR will show weapons that may have been found 10 years ago in the trash, yet they use them as evidence to demonstrate how violent we are and the type of weapons we use. Please! That’s one of CDCR’s oldest tricks! 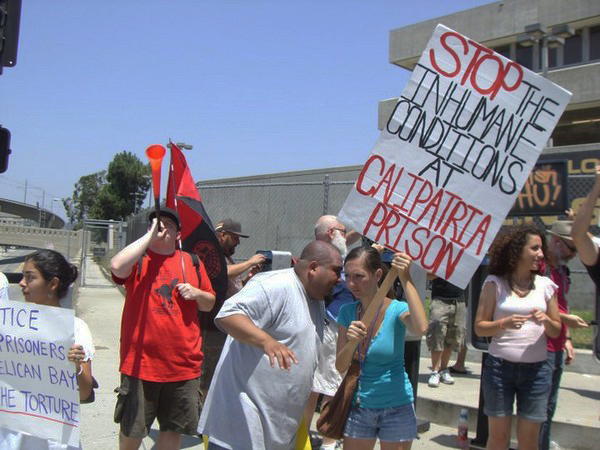 Robbie Riva, T-49359, is housed in Calipatria State Prison ASU (Administrative Segregation Unit) in solitary confinement under conditions similar to the SHUs at Pelican Bay, Corcoran and elsewhere. This story was transcribed by Robbie’s wife, Kendra Castaneda.